Some people know what they want from a young age; for Michael Kempf, he knew that he wanted to be a chef. His dedication and hard work earned him a place at the one-star Michelin Restaurant Fischerzunft in Schaffhausen, Switzerland working for two years for chef Andre Jaeger, the first chef in Europe to receive a Michelin star with Asian cuisine. He followed that opportunity working as Saucier and Entremetier for two years at the three-star Michelin Restaurant Dieter Müller in Bergish Gladbach, Germany, before joining Facil as Chef de Cuisine in April 2003. His passion was rewarded when Facil received its Michelin star. I had lunch at Facil in March 2007, and had the opportunity to follow Chef Kempf into the kitchen where he shared a few of his culinary secrets. He said, "It is a good atmosphere, a hard shop, with long hours, and my six-person team is young, and very motivated." One of his secrets he shared is his use of different salts for meat and fish. He likes to use Himalayan salt for meat, flaked sea salt from Portugal for fish, and hibiscus sea salt for white fish. 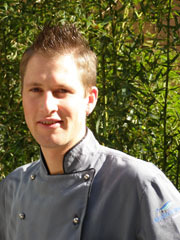 His culinary approach is modern with a clean look; he believes that the product is the star. 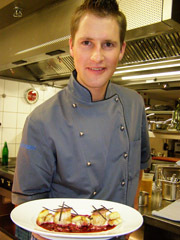 He changes the menu every four weeks, and looks forward to the seasons, especially the upcoming white asparagus season. "Spring is the best time in the kitchen for me when the vegetables are so colorful." He looks for inspiration in nature, when he is running and jogging, he feels that his head is free to think of new ideas. When I asked him what is next, he replied, "Two Michelin stars" which would be a first for Berlin. With his talent, creativity, hard work, and dedication, anything is possible. Wash and pat scallops dry. Cut the calf's head slices into 16 small circles the size of the scallops, and finely dice the remaining calf's head. Sear the scallops on both sides with butter and thyme. Top each of the scallops with a calf's head disk and heat through. Set aside. Cut the cauliflower in half and divide into florets. Blanch half of the cauliflower in boiling salted water, followed by a plunge in an ice bath. Mix the remaining half of the cauliflower with butter, sea salt and pepper, and steam over a water bath for 30 minutes until tender. Drain and puree. Season to taste. Sauté the blanched cauliflower in a pan with butter until golden and set aside. Mix the chicken broth with the finely chopped shallot. Cook until reduced to 100 ml (3.4 ounces). Add the port wine and red wine and cook until reduced to 100 ml (3.4 ounces). In a small pot, over low heat, add the finely chopped truffle and stir in the browned butter. Add the reduced broth mixture, and season to taste with salt and pepper. Presentation: Make a line of pureed cauliflower on each of the plates. Top with golden brown cauliflower florets. Sprinkle the chopped calf's head on the plate on either side of the cauliflower. Pool the sauce over the chopped calf's head. Place scallops garnished with the calf's head disks on the cauliflower puree. Finish by garnishing the scallops with julienne truffles. 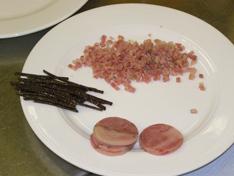 Read about Facil in the Restaurants and Chefs' Recipes (in German) sections. Facil is open Monday to Friday for Lunch (12:00 pm - 3:00 pm) and Dinner (7:00 pm - 11:00 pm). The restaurant is closed on the weekend.